The humble chocolate chip cookie. The New York Times considers it “perfection” (http://www.nytimes.com/2008/07/09/dining/09chip.html?ref=dining) and published a chocolate chip cookie recipe that was adapted from Jacques Torres. http://www.nytimes.com/2008/07/09/dining/091crex.html?ref=dining The recipe was interesting for a variety of reasons, but I found it most interesting for the correction to the modern day Toll House Recipe. 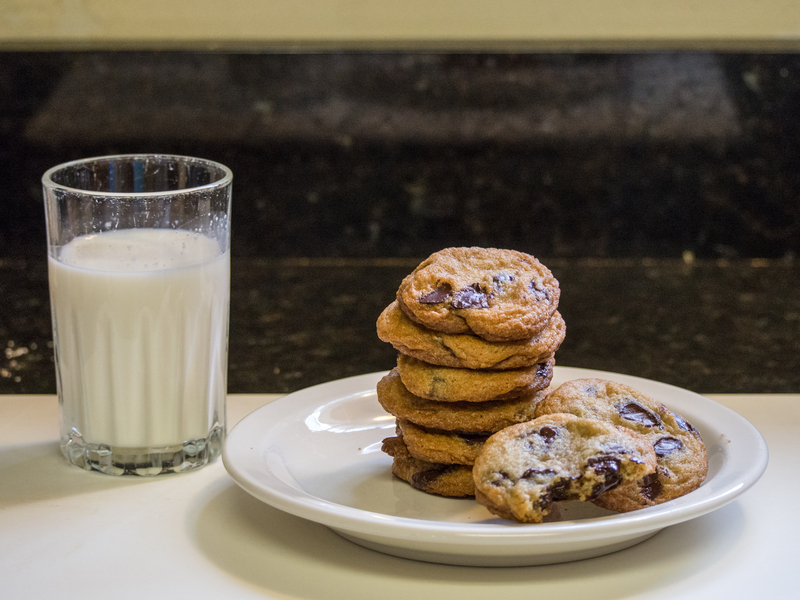 The Toll House Cookie recipe was sold by Ruth Wakefield from the Toll House Inn to the Nestle company for a lifetime supply of chocolate chips. The general story is that one day in the 1930s, Mrs. Wakefield was making “Butter Drop Do” cookies when she substituted chopped Nestle’s chocolate for Baker’s chocolate. She hoped that the chocolate would melt and turn the entire cookie chocolate. Needless to say, it didn’t. The rest, they say, is history. 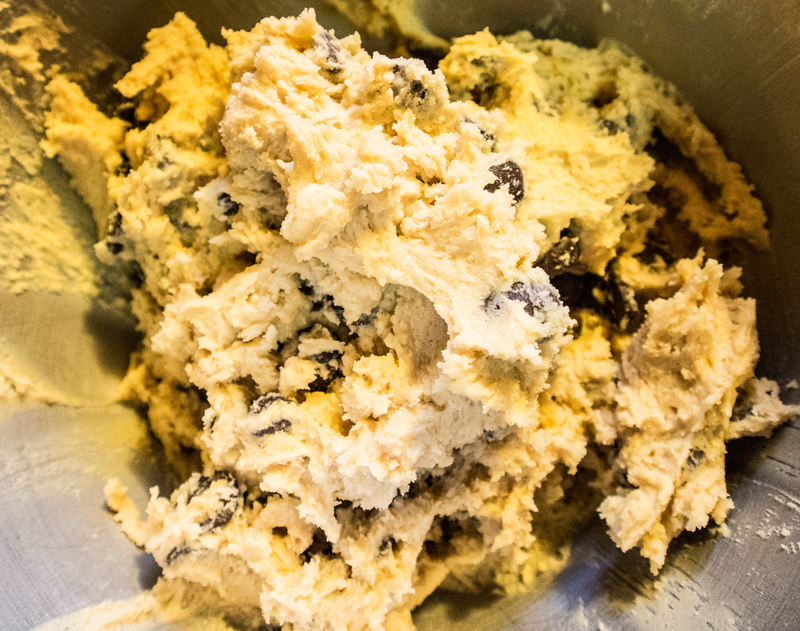 The birth of the Chocolate Chip Cookie. Now, the recipe she sold to Nestle required the mix to sit overnight in the refrigerator before baking. However, that part didn’t make it onto the back of the chip package. 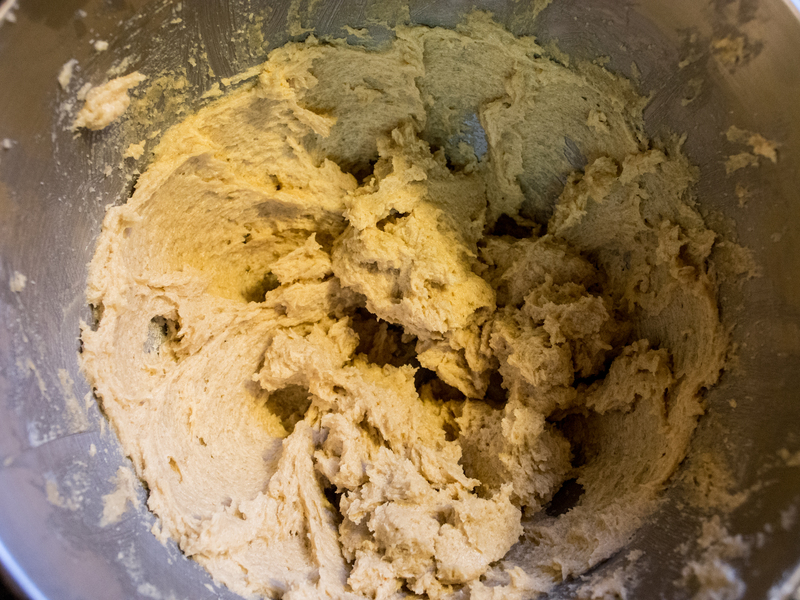 The New York Times tested what happened to the dough and the resulting cookie at various wait times and there were significant taste and texture differences. Let’s be real, no one is going to turn down a fresh cookie out of the oven. They just aren’t. But, I can assure you, the wait is worth it. The cookie takes on a more toffee flavor and is just more substantial. I’ve made the New York Times recipe. If you have bread and cake flour sitting around, give it a go. It’s a good (albeit) expensive recipe. Most of the time, I don’t have the cake flour handy, so I go with an all purpose flour recipe. Interestingly, I could not find a “butter drop do” recipe that called for chocolate. The one I found called for mace (ironic that I find that spice all over the place now in recipes). I would like to share one secret. My cookies get a lot of compliments. I’ve given the recipe out and people will come back to me and say that theirs didn’t taste as good as mine, even with the recipe. My kids like to tell people that my secret ingredient is “love”. Yes, it is. But, it is also Bourbon Vanilla Extract. I don’t buy vanilla extract at the store. One day, while watching Paula Deen, she said to make your own vanilla extract. Put split vanilla beans in a glass mason jar. Cover with vodka. Close the lid tightly. Let sit in a dark place. Shake occasionally and in a month or so, you have vanilla extract. I couldn’t believe that was it. So, I visited the food network site. I couldn’t find Paula’s recipe for vanilla extract and looked at the Barefoot Contessa’s: http://www.foodnetwork.com/recipes/ina-garten/vanilla-extract-recipe/index.html Pretty much the same thing. Bourbon in the “Bourbon Vanilla Extract” is used to describe the type of vanilla bean. However, I actually like bourbon better as the alcohol than vodka. So, technically, I use Bourbon Bourbon Vanilla Extract. I’ve shopped around. For Bourbon Vanilla Extract, you will pay $16 for 8 ounces of quality stuff on Amazon.com. I just bought a 1.75 liter bottle of Maker’s Mark from Costco for $38 plus tax. The same amount of this Bourbon Vanilla would set me back $118 and I’m pretty sure when the label says “water, alcohol, sugar and vanilla bean extractives”, I’m not getting Maker’s Mark quality alcohol. I’m not really sure what sugar is doing in there either. So, mine is Maker’s Mark and Bourbon Vanilla Beans that have steeped several months, per the Barefoot Contessa’s recipe. 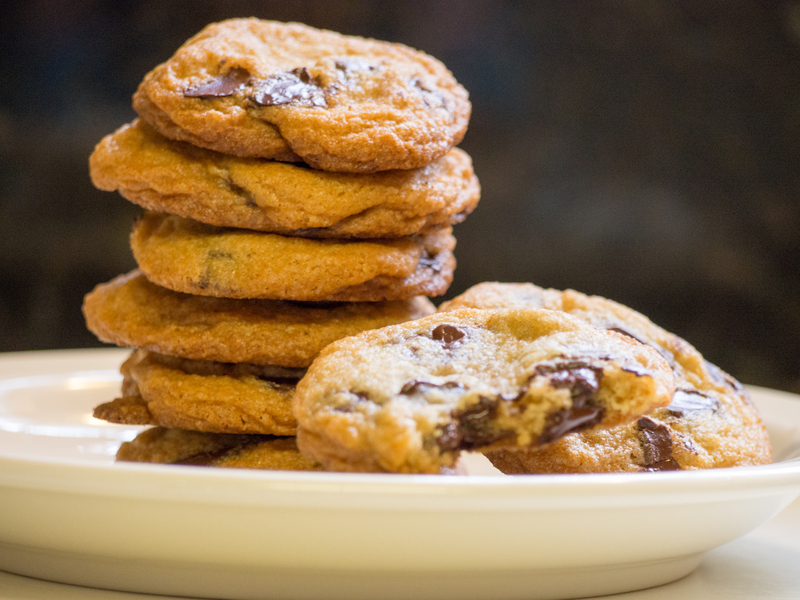 This one ingredient will separate your chocolate chip cookies from everyone else’s. ESPECIALLY if you let the dough develop overnight. Use real butter. I don’t use high fat, European butter, however. Just regular, unsalted butter. 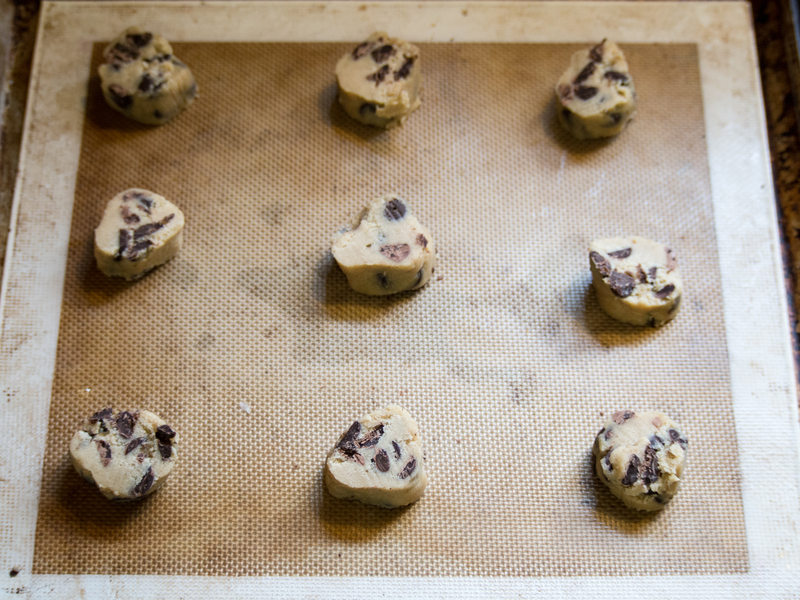 Line your cookie sheets or baking pans with either parchment paper or Silpat. Whisk dry ingredients together in a small bowl and set aside. 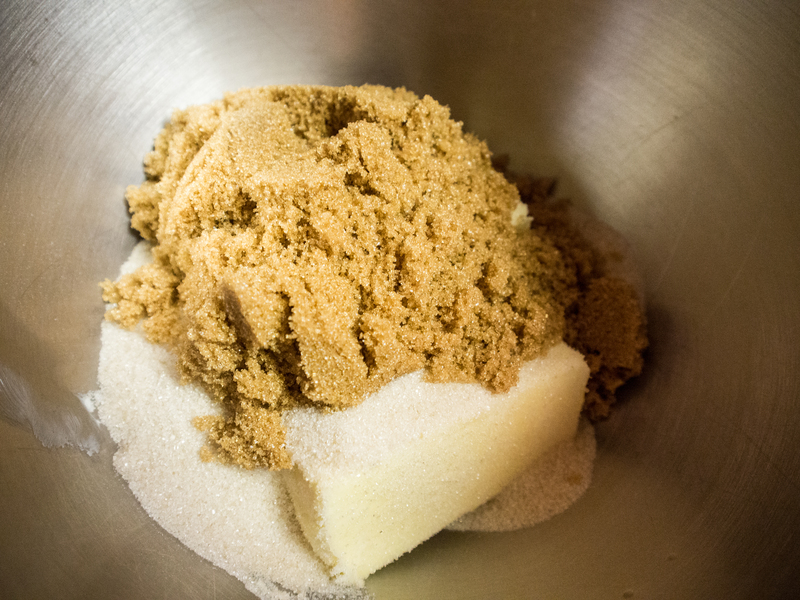 Butter and sugars just prior to creaming. 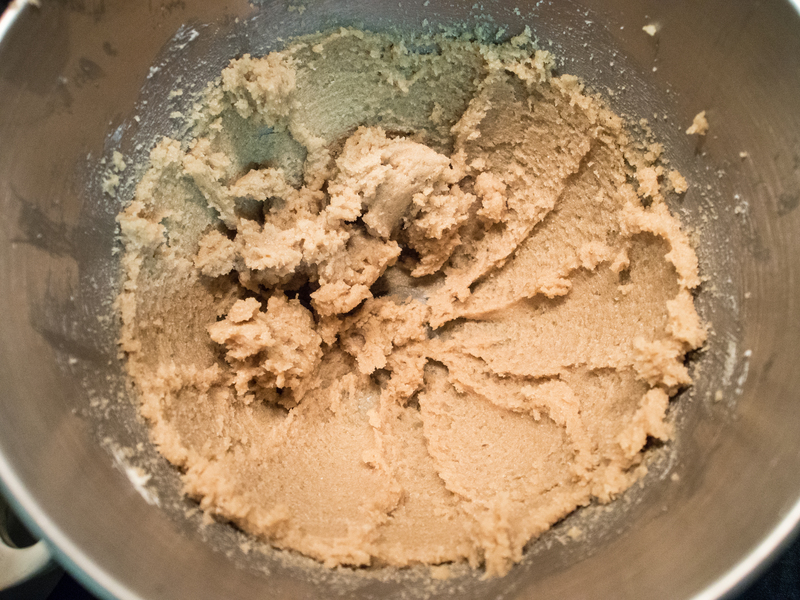 In a large mixing bowl, cream the butter and both sugars together until well combined and creamy. Add vanilla and mix on low speed until incorporated. Add each egg separately and mix on low speed until incorporated. Add the dry mixture in three separate additions and blend until incorporated each time. Stir in the chocolate chips. Bulkier and drier with the addition of the dry ingredients. 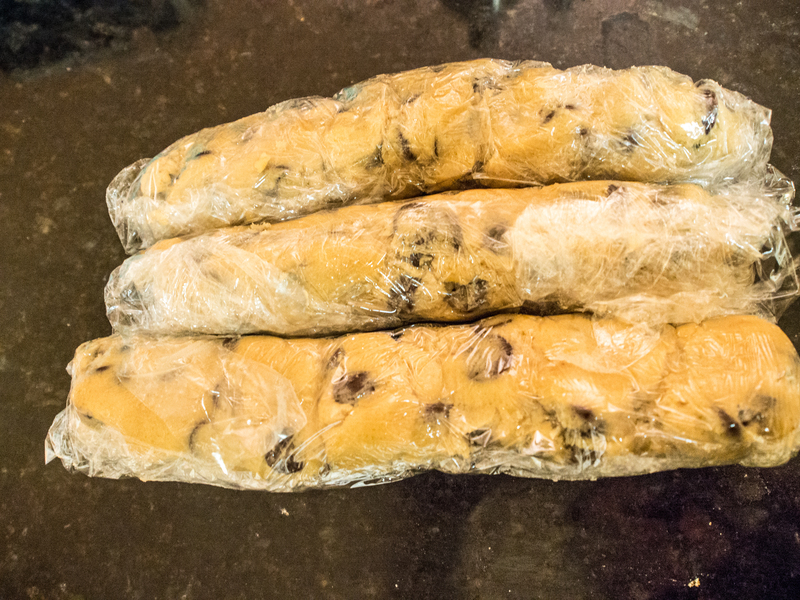 Cover the dough in plastic wrap and refrigerate for a minimum of 24 hours. You can leave it in the mixing bowl. I like to wrap them in logs and freeze the logs I don’t make for later use. That way, you don’t have dozens of cookies laying around and a fresh batch of cookies is just 12 minutes away!! Drop a tablespoon of cookie mixture onto a baking sheet covered with either parchment paper or a silicone baking sheet like Silpat. Cook for 9 to 12 minutes, rotating the pan at the halfway mark. Check at the 9 minute mark. Cookies are finished when they are uniformly golden brown. This entry was posted in Cookies and tagged Barefoot Contessa, Chocolate Chip Cookie, Ghirardelli, Nestlé, New York Times, Ruth Graves Wakefield, Toll House Inn, Vanilla Extract on March 28, 2013 by dawn of food.